OP3300. 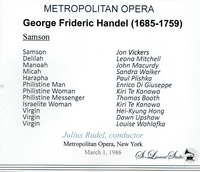 SAMSON (Handel), Live Performance, 1 March, 1986, w.Julius Rudel Cond. 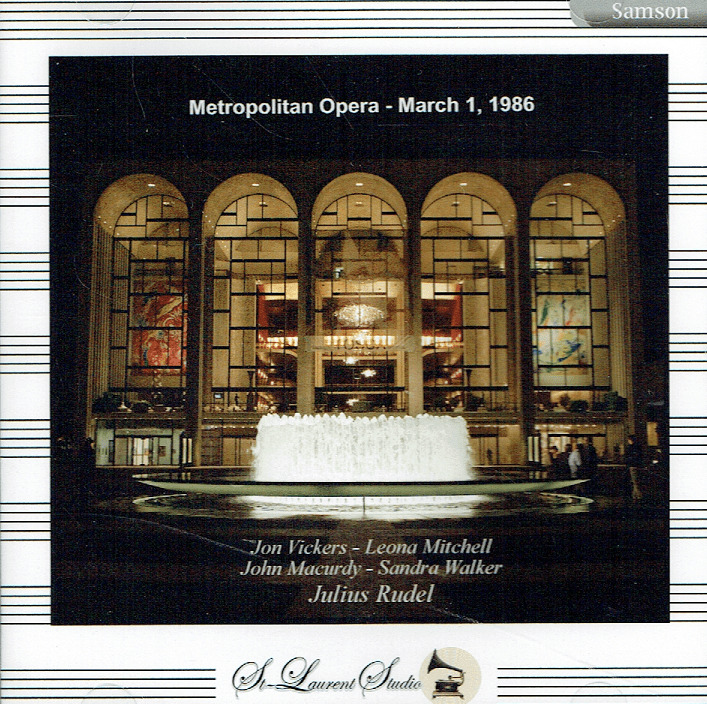 Met Opera Ensemble; Jon Vickers, Leona Mitchell, Kiri Te Kanawa, Sandra Walker, Paul Plishka, John Macurdy, Dawn Upshaw, Hei-Kyung Hong, Enrico di Giuseppe, etc. (Canada) 2-St Laurent Studio T-795. Transfers by Yves St Laurent. “St. Laurent Studio brings us the Met’s March 1, 1986 broadcast of Handel’s oratorio, SAMSON, starring Jon Vickers in the title role. The great Canadian heroic tenor was celebrated for his Florestan, Don José, Peter Grimes, Otello, Siegmund, Tristan, and Parsifal, among others. In such company, a Handel oratorio tenor part may seem an unlikely undertaking. Vickers himself well understood that he did not fit the classic mold for such repertoire. When Sir Thomas Beecham invited Vickers to take part in his 1959 RCA recording of Handel’s MESSIAH, he told the great British conductor: ‘I don’t possess what’s considered to be the typical English oratorio tenor voice’. Beecham responded: ‘Thank God for that!’ And Vickers’ contribution to the Beecham RCA MESSIAH is something to hear. During that stage of his career, Vickers possessed a voice of impressive power and beauty, albeit of a highly individual kind. And Vickers could also sing with admirable flexibility. The extended melismatic passages in ‘Every valley’ and ‘Thou shalt break them’ pose no hurdles for the young and robust artist. Vickers also phrases with great feeling and sensitivity for Handel’s vocal line. In truth, Jon Vickers proves the ideal casting for a recording that employs Eugene Goossens’ grand orchestration of Handel’s Baroque masterpiece. As it turns out, Beecham chose Vickers for the MESSIAH recording after hearing the tenor earlier that year in a Covent Garden production of Handel’s SAMSON, conducted by Raymond Leppard. 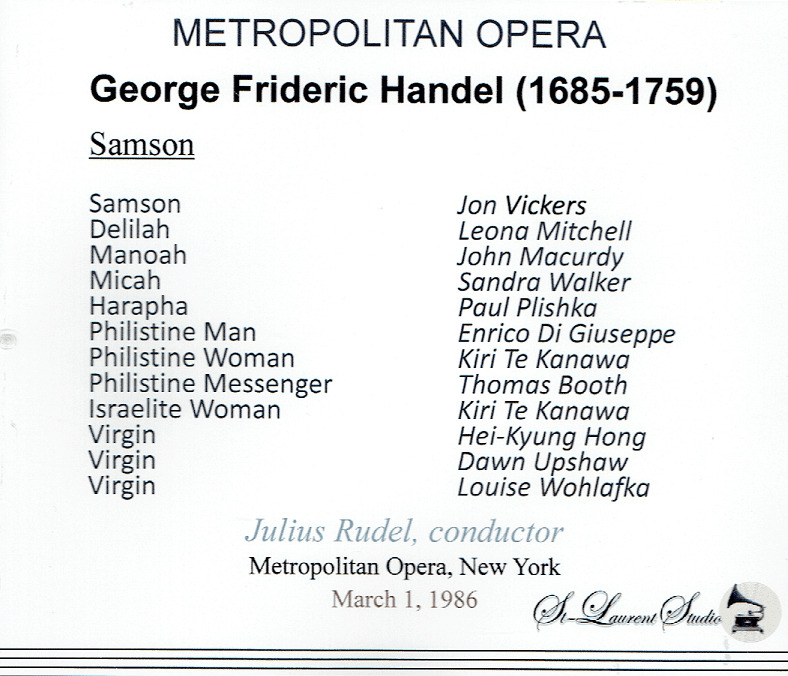 Almost 30 years later, Vickers took part in staged performances of SAMSON at Covent Garden, the Lyric Opera of Chicago, and the Met. This March 1, 1986 broadcast is a souvenir of the Met run of performances. By the time of this broadcast, the movement to present Baroque works in historically informed performances was in full force. As such, the Covent Garden-Chicago-Met Samsons inspired no small amount of controversy. The score, heavily cut, is performed by a modern instrument orchestra (admittedly of reduced forces), and with almost no ornamentation by the vocalists. And yet, this is a SAMSON that commands attention. First and foremost of course is Jon Vickers’ assumption of the title role. Vickers was one of the greatest singing actors of his generation, a person who embodied his roles in a manner unlike any other tenor I’ve witnessed (I saw him in FIDELIO, OTELLO, PETER GRIMES, and a recital of Schubert’s WINTERREISE). One of the things that set Vickers apart was his ability to portray in the most convincing manner a character in the throes of the greatest despair and pain, but without ever violating the integrity of the music. Whether it was Florestan’s ‘Gott! welch’ Dunkel hier!’, Otello’s ‘Dio! mi potevi scagliar’, Tristan’s Act III delirium, or the tortured cries of ‘Peter Grimes!’, you believed you were witnessing an actual breakdown, not merely its staged musical depiction. And so it is with Samson’s iconic aria ‘Total eclipse’! Vickers portrays the blinded Samson’s pain and despair in unforgettable fashion, but he does so by employing noble diction, legato, and the masterful application of dynamic contrasts. These are qualities that inhabit the totality of his interpretation. By this stage of Jon Vickers’s career, his voice, while as powerful as ever, had lost a good deal of its youthful bloom, now taking on a quality I can best describe as ‘craggy’. But I find that type of vocal quality entirely appropriate for Samson, a character both heroic and tortured. And while the quality of the voice is of later vintage, Vickers retains his vocal security. As with other Vickers roles, the tenor’s interpretation of Samson deepened over the years. In the Met broadcast, it attains a level of intensity that is often overwhelming. I think Vickers’s Samson is worthy to stand alongside his greatest achievements, and for that reason, this Met broadcast is essential listening. By the way, in the Met production, Samson is in chains throughout the performance, something that is quite apparent in the recording.